There are plenty of dark moments in the world right now, with so many scary things happening politically and socially. While we believe it is important to fight against these, we also need positivity and light in the world. And when we say light, we literally mean things that light up! Like the Ultimate Unicorn Craft Kits created by designer Natasha Dzurny based out of New Jersey. The Ultimate Unicorn Craft Kit is what you get if you mix a love of unicorns, dress-ups and sparkle, with STEAM skills (science, technology, engineering, arts, mathematics) and the desire to stand out. Natasha and her team at TechnoChic are currently running a Kickstarter campaign to raise funds for these kits, to be released just in time for Halloween and the Holiday season this year. 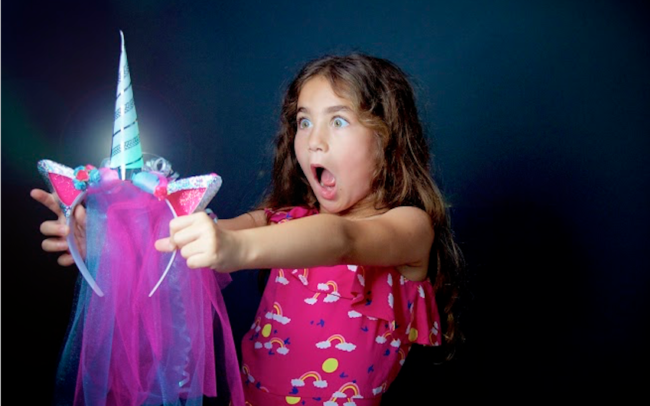 The kits have 4 accessories to create – the unicorn headband, the marvelous magic wand, the twinkling tutu, and the sparkling satchel. The coolest aspect of the kits are the ability for the user to learn how to put together electronic circuits to make the accessories light up. Who wants an unoriginal party costume from your local mall when you can have a unique outfit that you put together yourself! “Electronics aren’t just for robots! TechnoChic is making learning electronics fun and accessible to everyone, with no prior experience necessary. We want to change the social perception that’s been handed down to girls that robotics and engineering are ‘for boys’,” says a description about the kit. The kit comes with hand-selected quality craft supplies, pre-cut paper shapes, and electronic components. TechnoChic provides online instructions with detailed videos, photo illustrations, tips, and explanations of the skills learned. Build simple circuitry, paper engineering, and a sewable soft circuit as you transform into the unicorn of your dreams. The headband and tutu are highly customizable, because TechnoChic believes every Ultimate Unicorn costume should be as unique as the person who makes it. The headband, tutu, and satchel are also available as single-project kits. Although the imagery in the Press Kit and Kickstarter campaign feature mainly young girls, it should go without saying that these kits are for everybody, and we as adults can’t get enough of them! Listen, it’s been a rough couple of years politically, and there’s nothing better we’d like to do right now than get our craft on and make a unique unicorn headband to get us in the mood for fun. Here at GTHQ, we’re already imagining ourselves wearing these at the next Women’s March or local rally to stand out and remind people to give themselves permission to shine and sparkle. With Halloween around the corner, if you are keen to avoid the annoying highly-sexualized costumes pushed on women, the Ultimate Unicorn Craft Kit is your ultimate antidote to cultural misogyny. Be sure to check out and support the Kickstarter campaign which it is still running (until August 21st, 2018), and support a female-founded company and idea.